To visit www.chateaudeleclair.com, you must be of legal age to purchase alcohol in your country of residence. By clicking on "I am of legal drinking age”. You agree to the terms and conditions of use of this site. Château de l’éclair is committed to a progressive approach through corporate social responsibility. Our aim is to show the highest level of ethics towards all the people we are in contact with (customers, associates and co-workers, suppliers and neighbours etc.). Through this, we safeguard nature, people and the company and share our values and know-how. 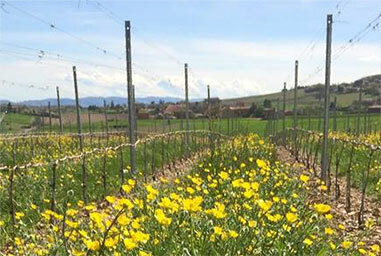 Safeguarding nature : Our commitment to more environmentally respectful viticulture (vinegrowing and tending) is demonstrated by membership of the Terra Vitis® network, managed grassing in our vineyards and our choices of biocontrol techniques. 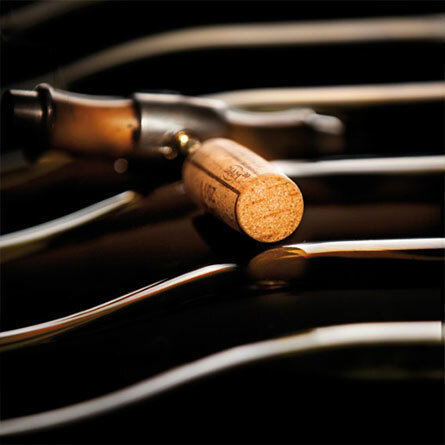 Safeguarding people : Our wines would not be what they are without the people who craft them every day. This high level of quality can only be attained through having a safe and healthy work environment. This is why we protect our human capital by reducing harsh working conditions and making risk-prone workstations safer. 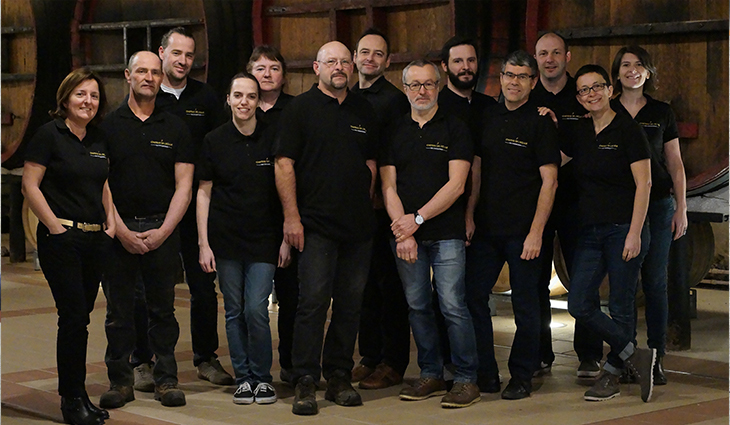 Safeguarding the company : For us to be able to continue to craft our wines the company needs to continue to be strong and viable. 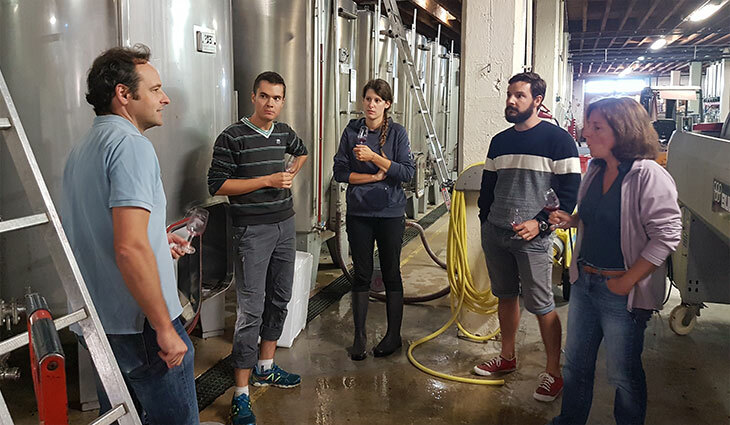 This can be achieved through a diversification of our range and improving the evaluation and management of production costs to offer contemporary wines. Sharing our values and know-how : Keeping our roots local is essential for sustainable development. 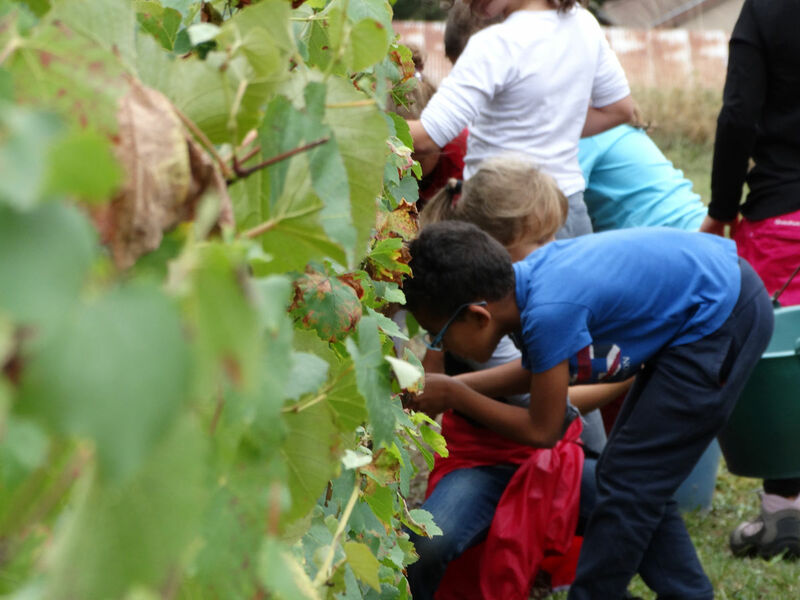 By hosting school trips, welcoming trainees and holding open days, we make sure our estate remains deeply rooted in the territory that is dear to us; the Beaujolais region. 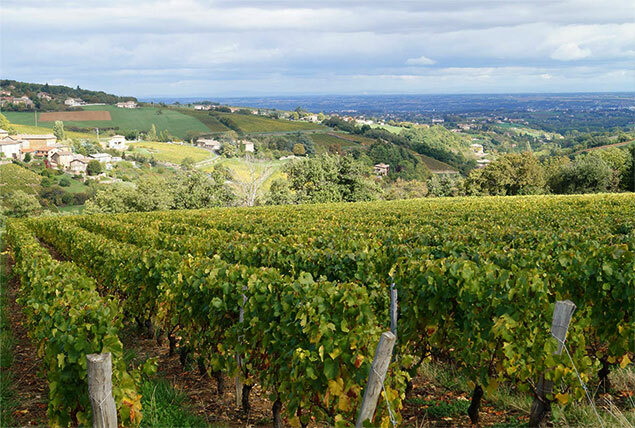 SICAREX Beaujolais works in synergy with the French institute of vines and wine (IFV), thus mutualising means and skills from the vine to wine sales. 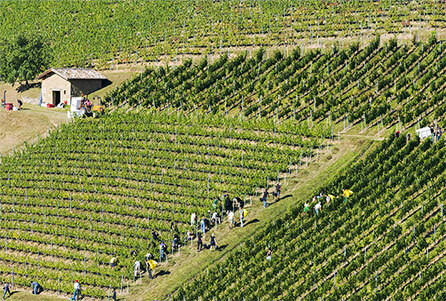 The SICAREX Beaujolais team has an array of original infrastructure to draw upon: Château de l’Éclair, a 20 ha (49 acres) experimental vinegrowing and winemaking estate is a medium for experimentation and an incubator for innovation, the sensorial analysis lab is used for the characterisation of the products of their research, as well as the laboratory and the small volume vinification nursery (each vat holds 20 to 40 L). 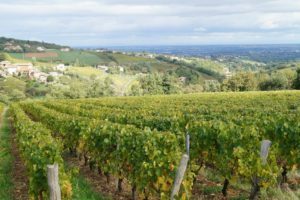 Beyond the issues faced in the Beaujolais region, our sphere of action extends to the neighbouring vinegrowing regions of Burgundy, Jura and Savoie. 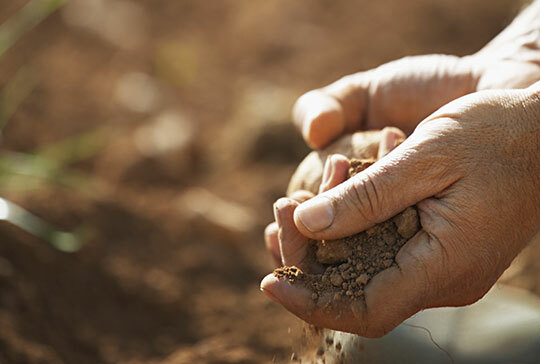 The Villefranche unit is at the forefront of the network for soil management, sustainable development, finding uses for and the use of vine and wine by-products, sensorial analysis and corporate social responsibility for some themes of international importance. 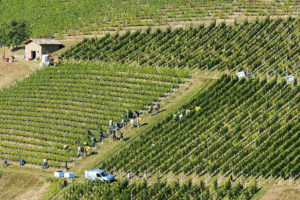 Our team’s multidisciplinary expertise supplies benchmark techniques and support for the sector for the creation, diffusion and conservation of plant material – particularly for Gamay, the region’s iconic grape variety – the development of methods and practices for environmentally responsible viticulture, the evaluation of the oenological quality of the grapes and production processes and on market knowledge and adaptation from a quality and safety angle. This work is carried out in cooperation with other French and European research centres. 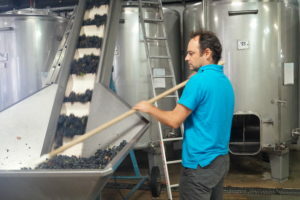 Michaël Larras: his arrival in 2000 coincided with restructuring our plot in Rivolet, where the grapes for our Red Beaujolais-Villages called “Inclinaison” are grown. Today, Michaël manages the estate and heads the Terra Vitis® approach, not only on the estate but also on a regional level. He has also been overseeing vinification since 2017. You can taste his optimism in the wines he crafts. 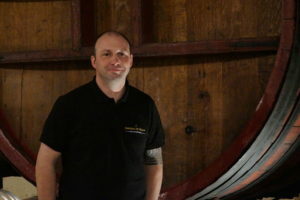 Stéphane Braillon: here since 2011, Stéphane’s mission is vine-tending and managing teams of seasonal workers. Experienced and meticulous, he likes a job well done. Jean-Pierre Berger: after several seasons spent on the estate, Jean-Pierre became a permanent team member in 2017. His job is a tractor driver and ever-cheerful jack-of-all-trades. 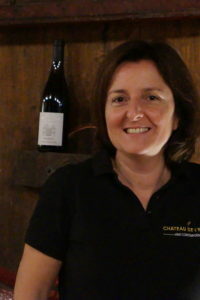 Amandine Piret: it was in 2008 that Amandine joined the team as sales manager to develop sales and wine tourism. Hers is the friendly face that welcomes our visitors. The winemaking estate belonged to the Guinon family. Nicolas-Philibert Guinon (1807 – 1885); 1st prize in chemistry from Lycée La Martinière in Lyon in August 1827, created a dyeing company in 1831. He founded the Lyon 75th dyers’ benefit society. He was awarded the Légion d’honneur in 1855. Nicolas-Philibert Guinon refined dyeing silk plain yellow using picric acid, the first synthetic organic dyestuff discovered in the world. The Guinon family made the Domaine du Convert (the name of the hamlet) their holiday home. At that time, the manor house, that is still standing today, neighboured the vinegrower-winemaker’s house (that stood where the Château stands today). Construction of the château started at this time. Construction of the château, at that time known as Château du Convert, was finished in 1871 by one of the family’s sons. Architecturally, the château can definitely be considered to be original, with the main entrance porch on the opposite side to the gates, meaning that visitors have to go round and see the building as a whole. 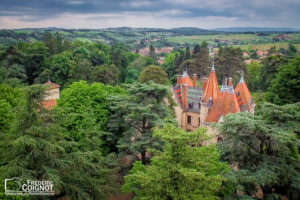 It is roofed with varnished Burgundian tiles, showing the wealth of the owner. It is said to be in the Viollet-le-Duc style. 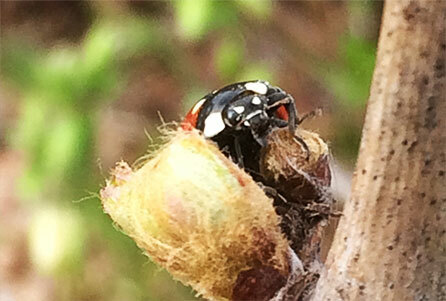 The entire Beaujolais vineyard was decimated by phylloxera (a destructive aphid). The Guinon family replanted the entire estate with vines twice, in vain. This ruined them and they had to let the château go. 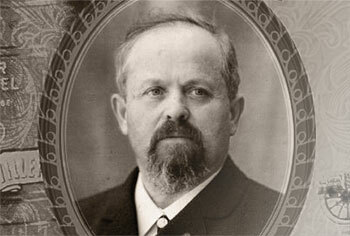 Victor Vermorel (1848-1927) moved to Liergues, purchasing the château and its vineyards, which he replanted with vines grafted using the technique developed by Victor Pulliat (a Beaujolais ampelographer – vine specialist). He renamed it Château de l’Éclair, after his invention, a back mounted sprayer called Éclair (created in 1888) and his daughter, Victorine, who was electrocuted in a bath at the château. He died in 1927. The entire estate was taken over by the Union générale de la mutualité du Rhône (a mutual benefit organisation). Château de l’Éclair became a hospitality centre (holiday camp, convalescence home etc.). Mr. Antoine Clément, estate steward, masterfully crafted excellent Beaujolais. With the help of Mr. Bocuse, Mr. Tsuji purchased the château to house a branch of his famous culinary institute. 120 Japanese students come to Château de l’Éclair to learn the art of French gastronomy every year. Aimé Nallet, 1997 Meilleur ouvrier de France, teaches cuisine there today. 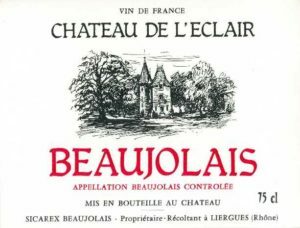 SICAREX Beaujolais, a local experimental research organisation that was formed under the impetus of vinegrower-winemakers, purchased the vineyards and vatrooms in 1980. 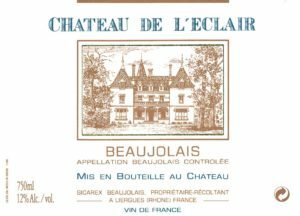 We became the owners of the Château de l’Éclair winemaking facility and a few hectares of vineyards as well as the Château de l’Éclair registered trademark. François Jacquet accepted management responsibilities for the estate. 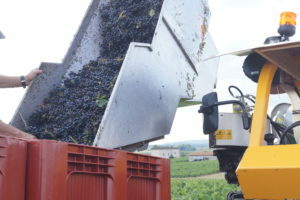 The estate activity started to grow with the purchase of a bottling and corking machine and we began to sell bottled red wine, mainly red Beaujolais. Lucien and Yves Legrand, Parisian wine merchants at Chemin des Vignes, challenged us to create a non-chaptalized wine (no added sugar), we accepted and did so. Eleven years later, we put our first cuvée of white Beaujolais on sale. The range hasn’t stopped growing since then. In turn, we have added a Beaujolais-Villages, a Chénas, a Crémant de Bourgogne, a Bourgogne Blanc, a Gamaret and even a grape juice to it; never leaving our Beaujolais and Beaujolais-Villages Nouveau behind! 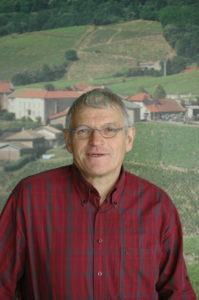 Jean-Luc Berger, director of SICAREX Beaujolais from 1988 to 2010, technical director at the French institute of vines and wine and expert at the International organisation of vines and wine, took over the management of this little 13-person unit. At the same time, the estate lands grew to over 20 hectares (49 acres). We created a meeting venue for our conferences, making it available to our colleagues from other organisations. Today, it is also used to host business seminars. At the same time as we were carrying out this refurbishment, we crafted our first cuvée of White Beaujolais, using 100 % Chardonnay. Valérie Lempereur, shared her expertise with us when she became our oenologist. Today, she is an elected representative at the International organisation of vines and wine (OIV). Arrival of Michaël Larras. He was recruited as part of the drive to restructure our vineyards on steep slopes, resulting in our first cuvée of Beaujolais-Villages called ‘Inclinaison’ using grapes from a vineyard on the commune of Rivolet. Thierry Decouchant, a technician at SICAREX Beaujolais, set out our special guidelines and the health and safety at work programme. Amandine joined the team as sales manager to develop our wine sales and wine tourism. Hers is a professional and friendly welcome. The estate launched its wine tourism activity. The number of visitors we welcome increases by the year. Bertrand Chatelet, who had been working here since 1999, became the new director when Jean-Luc Berger retired. 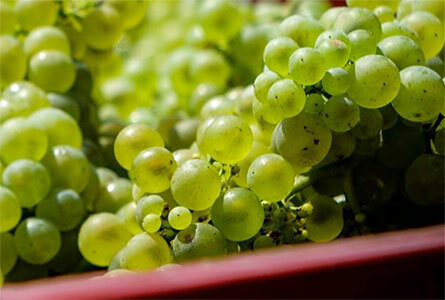 We crafted our first cuvées of Bourgogne Blanc (white Burgundy) and Gamaret to offer a wider range of products. We adopted the Optipulvé approach and reduced the number of passages by 30 %. Our first cuvée of Beaujolais-Villages Nouveau was released on to the market. 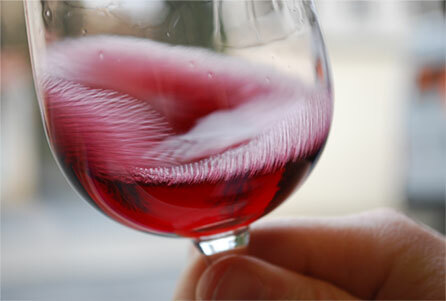 We implemented HACCP, to ensure the traceability of our wines and grape juice. Our estate joined the Terra Vitis® network. 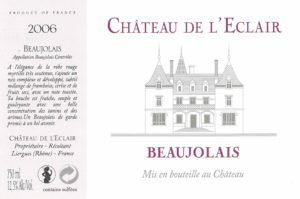 New graphics were created for the Château de l’Eclair trademark reinforcing our high-end positioning. We also set out our Corporate social responsibility (RSE) to progress towards being an even more responsible, model and sustainable estate. We organised our first open days for the general public. We invested in the purchase of a small harvesting machine ; it is a Beaujolais-designed prototype created to keep the bunches of grapes whole. We added a Gamay Teinturier (with red rather than clear juice) grape juice with no added preservatives or sugar to our range. This craft grape juice is entirely natural. We replanted a vineyard in Chénas with a variety of aims including low density plantation, trellising and grassing between the rows of vines. Michaël Larras is now in charge of the estate, taking over from François Jacquet. Today, Michaël is continuing to uphold Terra Vitis® at Château de l’Eclair and, since recently, within the regional association as technical manager. who put their stamp on the history of Château de l’Éclair shines through. We are fully aware of the complexity of natural ecosystems and do our utmost to understand them so as to gently and effectively steer them towards protecting the vineyards. We limit external additions both in the vineyards and in the cellar. 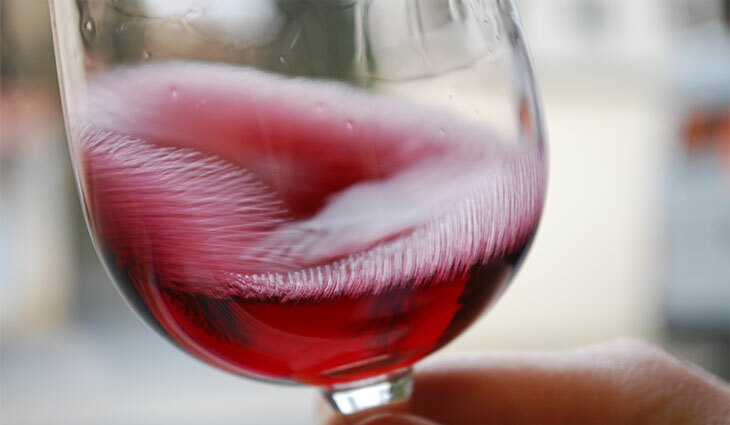 This means that our wines are a true reflection of our grapes. 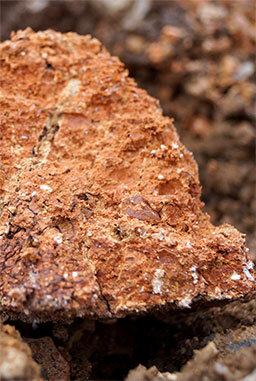 Our natural ecosystems allow the expression of our terroirs and guarantee our wines’ typicity. Care for the vines is at the forefront of our tending choices, we use eco-friendly/integrated techniques and belong to the Terra Vitis® network. 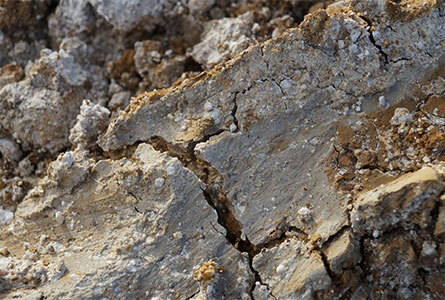 We respect the balance between vine, soil and climate. Our strategy is proactive, using natural and preventative measures as early as possible. 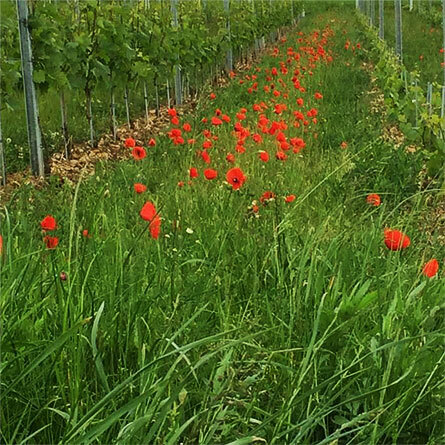 Our vineyards are grassed to encourage biodiversity, limit erosion naturally and manage our vines’ growth rate. This guarantees optimum concentration of our grapes. 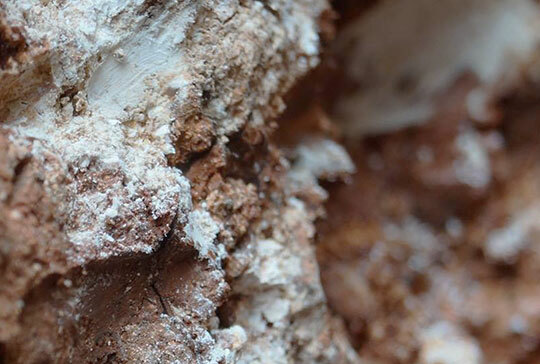 It is the soil type and climate that guide us in our technical choices. we limit the number of times mechanical apparatus (that compacts the soil) is driven through our vineyards. All these actions combined are our pledge to tend our vines in respect of the environment. 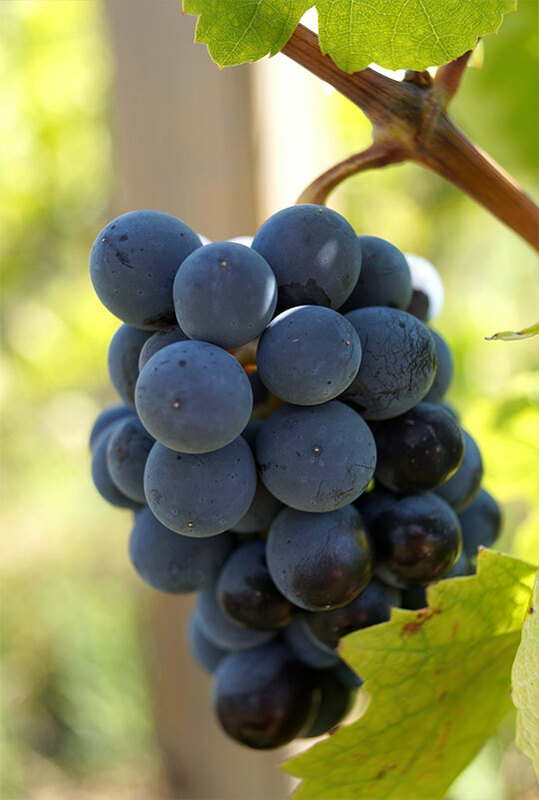 Good grapes are the foundation of a good wine! Today, we work 20 hectares (49 acres) of vineyards planted with Gamay, Chardonnay and Gamaret. Our vineyards are on a number of communes: from the gateway to Pierres Dorées or golden stone Beaujolais in Jarnioux and Rivolet, via Saint-Étienne-la-Varenne, to Chénas to the north. Having this diversity of terroirs means that we are able to bring you a wide range of quality wines. 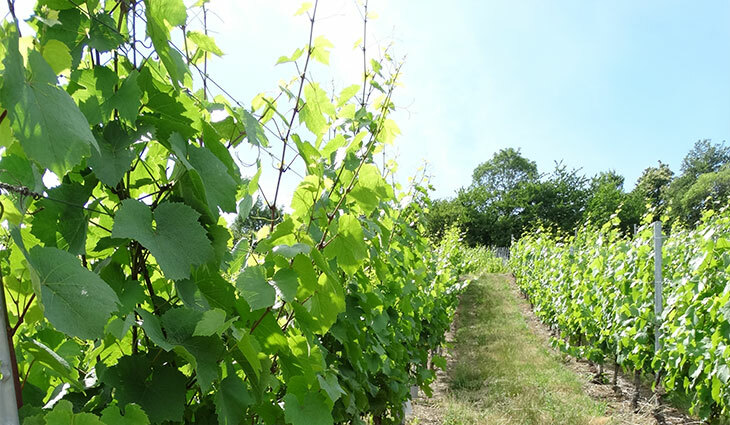 We have made some innovative technical choices that include the use of DIAM natural corks (certified no cork taint) and investment in a harvesting machine that keeps the bunches whole with its ingenious picking system. 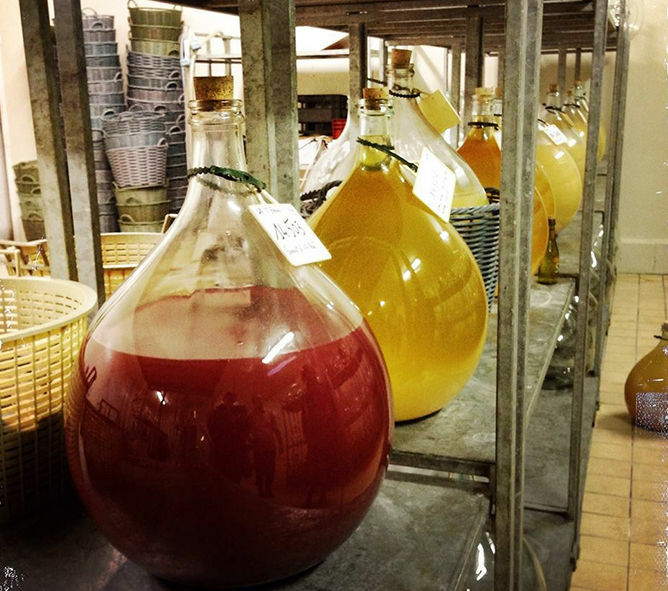 Château de l'Éclair boasts an experimental wine nursery. This unique tool is used in collaboration with our team of engineers and technicians from SICAREX Beaujolais and the French Institute of vines and wine (IFV). 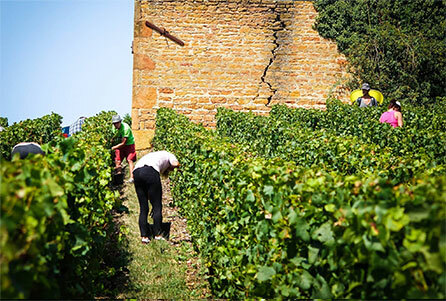 Here we strive to further improve the quality of wine and how it is crafted in the Beaujolais region. 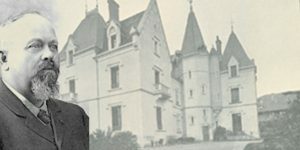 Already in 1891 Victor Vermorel, the inventor and owner of Château de l'Éclair, had a passion for vine and wine research. Today, we are proud to be continuing in his footsteps. 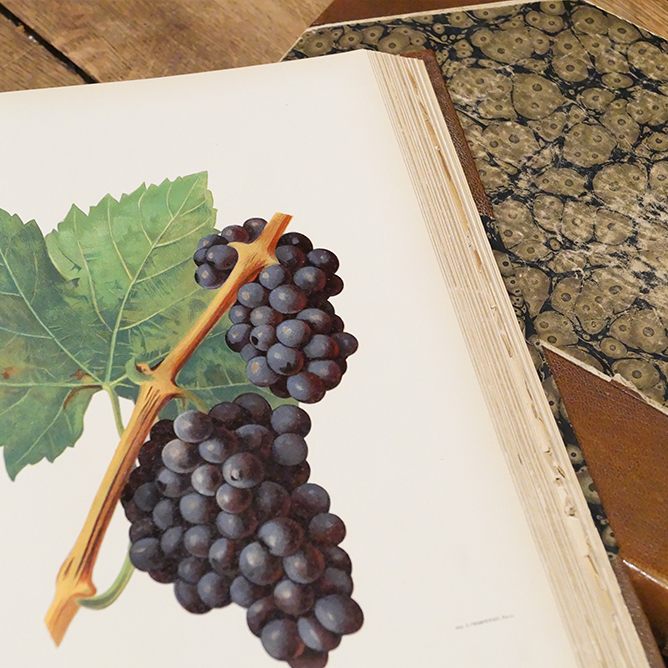 Through our trials from the vine to the glass, our endeavours are undertaken in respect for the environment, the vines, wine, the people who drink it and the many traditions to which we are the heirs.